Are you looking for the best blogging resources for your creative small business? I am sharing my favorite tools to get started! These are some of my favorite tools for running a business, client management and blogging. I’ve included my affiliate links where possible, but I have only recommended tools I faithfully use! I hope they are helpful to you! WordPress.org– I chose WordPress because it provides a robust platform for building a secure website and blogging format. Restored 316– Refined Theme I discovered Restored 316 a long time ago and many of my clients use these templates to run a successful blog. They are clean, bright, and feminine. Their tech support is amazing, but most importantly, they give you a lifetime of updates. There is so much value in this feature. StudioPress Themes for WordPress- The Genesis template is required before using any Restored 316 theme. SiteGround– This is who I use to host my website- the price is amazing and you can choose a package based on your page views. Promoted Pins 101 Course– Want to get started using Pinterest Promoted Pins (ads)? Alisa Meredith is the QUEEN of promoted pins and has a direct contact with an ads manager at Pinterest. This course will teach you what you need to know about promoted pins! Thinkific– Build beautiful courses with video, audio, and text resources for your audience! This link gets you $50 off too! Building a Framework– Many of my clients have used this book to start their blog. Abby’s book is a great resource and includes everything you need to get started, especially if you are in the DIY/Home blogger niche. Restored 316- How to start a website– This is a great resource from start to finish! Vanessaryan.co Create Beautiful e-books and opt-ins using Canva Templates! Feminine and customizable. Disclosure Policy– You must have a disclosure on your site, but this makes it easy to create and compose. The Contract Shop– Is your biz protected legally? The Contract Shop offers every type of contract and resource you can think of. From independent contractor contracts to protecting your business legally, this site has you covered! Disclosing your affiliate links– You definitely need to properly disclose affiliate links- Amy Lynn Andrews helps you with what you need to know. Atelier 21– Beautiful lifestyle stock images from a talented friend. Use code ‘vanessakynes’ to get 10% off! SC Stockshop– The premier site for feminine stock photography. SC Stockshop’s images are detailed, featuring desktop flat lays and bundles highlighting a hard-working, yet stylish female entrepreneurs. Maison de Pax- Creative Market– If you are looking for crisp, bright images to use in your social media or blog posts, then Rachel at Maison de Pax is your girl! Her beautiful curated collections feature bright florals in a minimalistic fresh style, surely to enhance the look of your business. She’s also a dear friend and client. 5 ways to use Stock Photos-In this post, I share 5 ways to use stock photos in your overall brand and blogging strategy. Twigy Posts- Creative Market- Twigy Posts’ are natural, minimalistic, and full of variety bundles, perfect for your blog posts, instagram, or Pinterest pins. Haute Chocolate– This site has a great variety of detailed images for the female entrepreneur. Unsplash– Absolutely free stock photograph that can be used in a variety of ways. Death to the Stock– I haven’t personally used this resource, but it is a popular resource for Stock Photography. Canon Rebel XT– There are plenty of better cameras out there, but this entry level DSLR has served me well! Tamron AF 28-75mm f/2.8 Lens– This is a great zoom lens that works well in lower light situation. I use this for home photography purposes. Canon Lens EF 50mm f/1.4 Lens– This is a great fixed lens for low light situation. Perfect for close ups and creating that beautiful bekoh and crisp images. Tripod– I love using a tripod to prevent camera shake and getting crisp quality photos. Good for flat lay imaging to create gorgeous blog images. Lightroom– Lightroom is generally less expensive and preferred by photographers. You can purchase Adobe Creative Cloud on Amazon to use, along with photoshop. Photoshop– I have been using Photoshop for years with various purposes. It is still my preferred application for editing photographs. Marble Contact paper– for creating beautiful styled shots with the look of marble! YouTube– YouTube is a major social media platform and a great place to host live or uploaded videos. You can upload videos to your blog as well as afterwards. And remember, video is king! Don’t be afraid to use it in your overall strategy. Iphone 7– Of course, this is useful as a phone, but I also use it for filming my YouTube videos. I use this attachment to hold my phone steady with the tripod. Zoom– I love using Zoom for live screenshot conference meetings and videos! This is a great resource. Vimeo– Another great resource for video hosting. Blue Snowball Microphone- I have heard great things about this microphone. I found it a bit heavy for what I needed, but has clear crisp sound. ConvertKit–ConvertKit is a great tool for email marketing! I love using it although it can be more expensive than Mailchimp. Mailchimp– This service is free up to 2000 subscribers and is super user friendly! If you think you will outgrow 2000 subscribers quickly, it might be worth starting with ConvertKit. Bluchic Landing Pages– Beautiful WordPress landing pages for sales pages to show off your course, freebie opt-in, or services. A one time investment of $67 and includes 7 different landing page templates for WordPress. Asana– Great for managing projects and lists. I use it for everything from business and personal packing lists! It is easy to use on desktop and a wonderful app for staying on task! Honeybook– A favorite client management tool for delivering proposals, contracts signed, and invoices paid! Get 50% off your first year of Honeybook with this affiliate link here! Trello– This is a highly visual and beautiful organization tool for organizing anything and everything. I love using this for personally planning my posts and making a rough outline. I can’t wait to discover more features of Trello! Hello Sign– Easy way to send and sign contracts or agreements. Moo– Beautiful business cards for networking and conference events. Get 20% off your first order with my link! Day Designer– Gorgeous designs with detailed daily and monthly layouts. I really pushed hard to use a paper planner and this is the one I love! It helps me with brain ‘dumps’ and block scheduling which is super important for managing multiple accounts. Google Drive I love using Google drive to share files and folders and it is completely free! Some clients add me to their calendar so that I can help keep track of their content. This is my favorite tool and an absolute necessity in my business. Dropbox is another great resource for sharing files and resources. I love its function for this, but tend to rely on Google Drive. 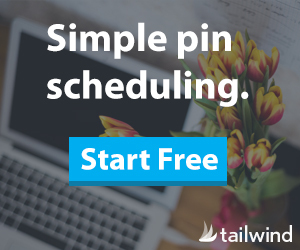 Tailwind– Sign up to get a free trial! I discuss Tailwind a lot! It is the key to my Pinterest Marketing Strategy- You can get started here with a video tutorial! Meet Edgar- Meet Edgar is a unique social media scheduling tool. It allows you to create a content calendar by category. It is SO unique and I love how it functions. I use Meet Edgar for scheduling seasonal content with my clients who have a lot of evergreen and seasonal material. If you have a lot of content to rotate, this is a super helpful tool that will drive traffic to your site. Buffer- I have used Buffer for Facebook and Twitter scheduling. It is a useful tool and the basic option is helpful for rescheduling posts. Later- Later is a great tool for scheduling and curating a beautiful Instagram feed! It has a lot of other tools and analytics too. Wave App– You can use Wave Apps to create and organize professional looking invoices. It can also be used to keep track of the accounting of your business. Paypal– Obviously, Paypal is useful for getting paid. It does have fees, but is quick and easy to transfer between your Paypal and bank account. PicMonkey–I personally use Canva, but a lot of my clients love PicMonkey. Canva–This is my favorite online tool for creating quick and easy blog and social media graphics! So many customizable templates. Adobe Spark– Recently, I started using this powerful tool! Similar to Canva, but it does allow you to resize images from a Pinnable size to Instagram in one simple click! This is a paid feature on Canva, but absolutely free on Spark! 5 ways to use Stock Photos – Check out this post where I blog about using stock photos to create social media content. Google Analytics– Google Analytics is a powerful free service that can be installed on your website. Google analytics is a must for learning more about your incoming and outgoing website traffic. It’s easy to install too. Podcasts have taught me SO much about orienting and encouraging me in my business! Find one that fits your personality and subscribe on your phone. You won’t regret it! *also, funny story, my kids recorded a podcast based on GoalDigger and we sent it to Jenna! Amy Porterfield- Amy is the guru on online marketing; this podcast is a must for learning about online marketing. The Creative Empire- This dynamic duo seems to host people who are answering the questions in my mind! I always feel inspired and more pumped about growing my creative business after listening to their podcasts. Simple Pin Media- Kate Ahl talks ALL things Pinterest! She is insightful and so clear- this is a great resource!